Pilates’ beginner exercises are a great way of becoming familiar with the whole Pilates exercise system. These introductory exercises utilize the mat and are designed to build core strength, flexibility, and stability. Each Pilates stretch and exercise engages the abdominal muscles. If you’re a beginner at Pilates, here’s what you should do. Start by including a fifteen minute Pilates workout in your daily routine. The only equipment you will require is an exercise mat. As your comfort level improves with the basic exercises, you can attempt a more advanced set of Pilates moves. If you’re trying Pilates moves at home, the obliques are an easy way to begin the routine. A study published in the Archives of Physical Medicine and Rehabilitation in 2011 found that Plates improves flexibility, balance, and muscular endurance. According to a study published in Sports Health in 2011, it is beneficial to use Pilates in physical rehabilitation. Try some of these non fussy exercises if you’re a Pilates beginner. This exercise focuses on strengthening your abdominals and toning your waist. Start by sitting up with your legs apart. Hold a band of cloth in your hands and raise your arms over your head. Take a deep breath and exhale as you turn to your side. Try to let your hip muscle guide you. Inhale as your stretch your arms out, but keep your hips in place. Take a deep breath out and return to the starting position. Repeat this exercise for four sets. This exercise targets your abs as well as your back. 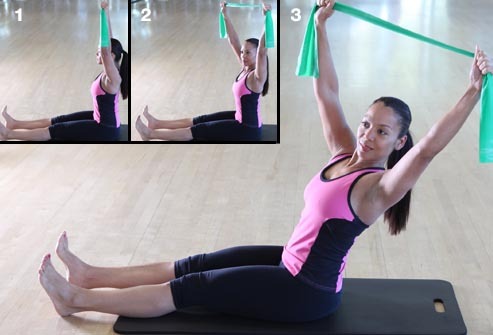 If you’re a beginner doing Pilates at home, Pilates exercises like the shoulder bridge are highly recommended. Start by lying in a supine position, with your feet open to equal hip width. With your arms at your side, raise your hips without curving your back. Keep the muscles in your hamstrings and buttocks tight as you hold this position for 5 seconds. Then slowly lower yourself to the mat, one vertebra at a time. This exercise targets the muscles in your back. Start by lying flat on your stomach, with your feet positioned together. Slightly raise your arms and chest off the floor and bring your hands out, with your palms facing down, so that they’re perpendicular to your body. Take a deep breath in and as you exhale, move your arms behind so that they’re parallel to your back and pull your chin upwards. While keeping your waist pressed down on the mat, use the muscles in your back to bring your arms closer to your body. Repeat this move five times. 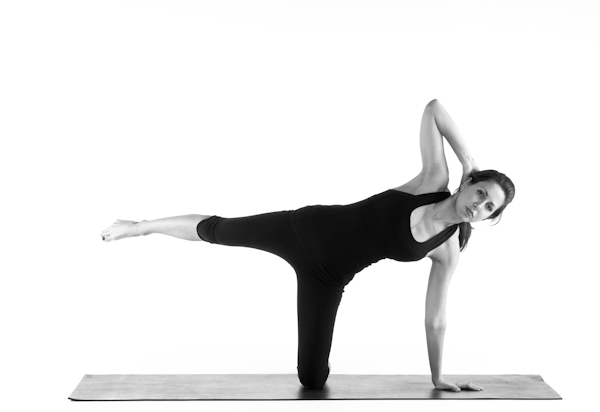 The “Letter T” exercise can be an effective addition to a Pilates program at home. This is a great exercise for toning your thighs and buttocks. Begin by kneeling on the mat. Leaning leftwards, place your left hand on the mat, under your shoulder. Position your right hand behind your head, with the elbows pointing outwards. Bring your right leg up so that it’s parallel to the floor. Keep your torso steady and begin kicking to the front and then to the back. Repeat this exercise for five times on each side. Kneeling side kicks are a good exercise to do as apart of Pilates at home for beginners. If you’re doing Pilates at home, this can be an excellent exercise for raising your heart rate and toning your legs. Stand upright and cross your arms across your chest, at the height of your shoulders. Tighten your abs as you breathe out and lift your right knee towards your right elbow. Quickly lower the right leg and repeat the step on the left side. Continuously switch sides for at least 10 swings. Add leg swings to your Pilates routine for home. Doing Pilates at home is a great way for people of all ages to get low-impact exercise. These beginner exercises are excellent to start an exercise regimen. As you stick to the Pilates routine, you’ll see yourself growing fitter, more toned, and healthier than before. Before starting with Pilates, consult your family physician to ensure that by adopting this form of fitness, you won’t be aggravating any existing medical condition. This entry was posted in Fitness and tagged at home pilates, pilates at home for beginners by Zipheal Editorial Staff. Bookmark the permalink.